Summers in Erie are chockfull of celebrations. Without even looking for them, you could stumble across a few festivals over the course of a couple of days. By combining live music and good food, you have the recipe for a fun-filled event. Really, the only thing that would be better is a musician that can serve up some grub while laying down some killer tunes. Now, if that last bit makes your stomach growl and your ears perk up, then have I got a super—or in this case supper—event for you. Bill "Sauce Boss" Wharton just so happens to share your love of tunes and spoons. Like a number of music-loving foodies out there, the two worlds make a perfect pair in Wharton's world. "How many parties have you had where there's music going on and everything where everybody ends up at one time or another in the kitchen?" asks the Floridian guitarist. "Just about all of them." Part of the 8 Great Tuesdays lineup, Wharton will take the stage at the Burger King Amphitheater at Liberty Park July 24. 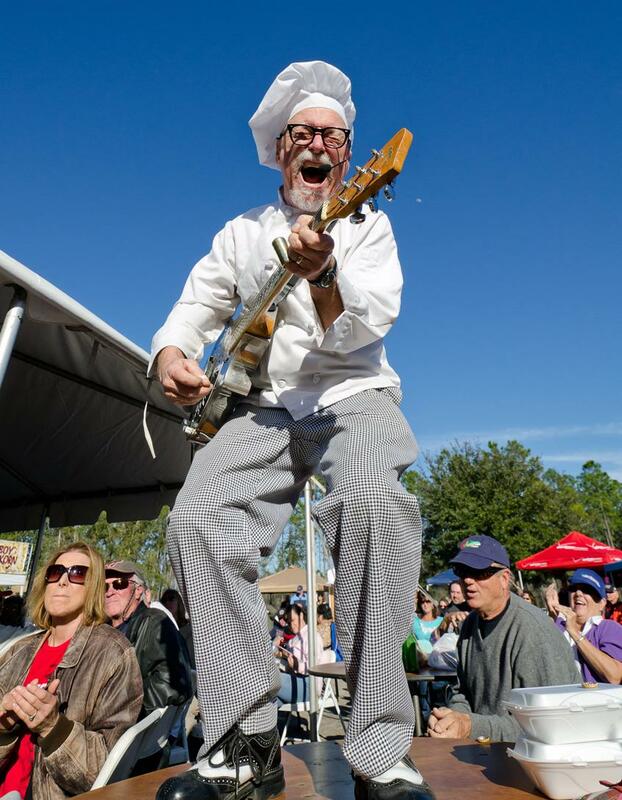 Not only will the veteran axeman treat Erie to his own brand of swampy Florida blues, Wharton will prepare gumbo for the audience throughout the show, his way of uniting food and music. "I bring the kitchen to the people," Wharton says. "It makes it so that everybody relaxes. You go to the Greek Festival, and they have a band playing. It doesn't matter where you're playing, food and music are inseparable." While compositions and consumption have been big factors in Wharton's life, he didn't combine the two right away, despite dabbling in spices early on. "I started making hot sauce in the late '70s, early '80s, because I wasn't satisfied with the hot sauces out there," Wharton says. "I made it for my own purpose and everybody would come over to my house and eat up all my hot sauce, so I decided to bottle it up and carry it around with me. After that, it just wormed its way into my act. I was doing kind of a snake oil routine, like the 19th-century guy running around all over the place extolling the virtues of this elixir of life kind of deal, so I did that for a while." Eventually, Wharton went into the recording studio with fellow musician Raful Neal, whose wife Shirley would make gumbo for everyone. Inspired by the grub, Wharton whipped up a batch of gumbo for the first time on stage at a New Year's Eve show in 1989, and the "Sauce Boss" was born. 180,000 bowls and hundreds of original songs later, Wharton is ready to cook up a musical storm for the Flagship City. "The whole show is different," Wharton says. "It's all original music. It's my own thing. The music will be different than anything anybody has heard, and the gumbo… I'm not sure of anybody else that's doing this." With bluesy beats and spicy eats, the "Sauce Boss" sure hits the spot.